Add Amazon Pay to your BigCommerce store and let hundreds of millions of Amazon customers shop on your website. Enable Amazon Pay on your site and test by using Sandbox Mode to make purchases without actually processing a payment. No matter what your size business, BigCommerce has a solution that will help you sell more. Plus, with Amazon Pay, hundreds of millions of Amazon customers can pay on your website or mobile site with the information already stored in their Amazon account. It's fast, easy and secure, and helps you add new customers, increase sales, and reduce fraud costs. Leverage the trust of Amazon to grow your business. Amazon Pay is easy to install. Not to mention, it's a seamless experience for your customers: All interactions take place in in-line widgets so customers never leave your site. 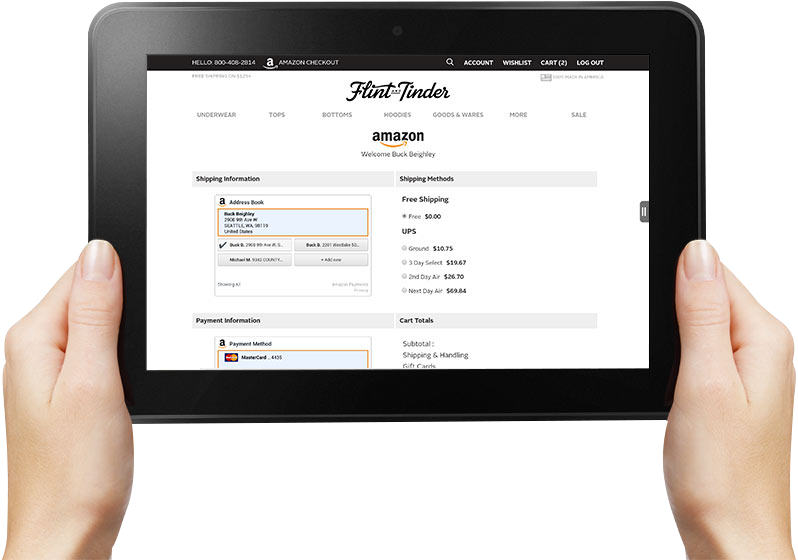 Customers simply login using their Amazon account, select a shipping address and payment method, and then confirm their order. Since most visitors are already logged into their Amazon.com accounts, the implementation of Amazon Pay into our website, has made it possible for a customer to land on our website and checkout in less than 44 seconds. BigCommerce made [adding Amazon Pay] really easy. I like it, glad I added it to the site.